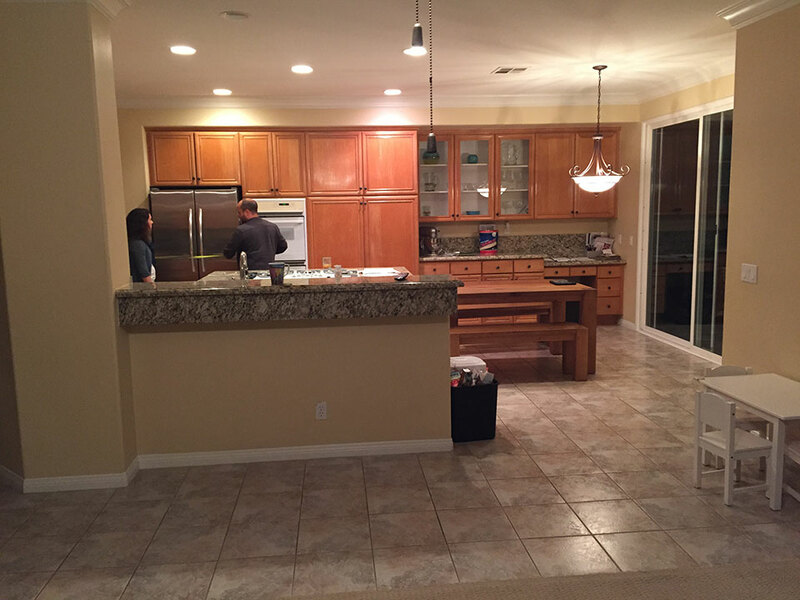 A home in Rancho Santa Margarita got a complete kitchen overhaul with the help of APlus contractors. 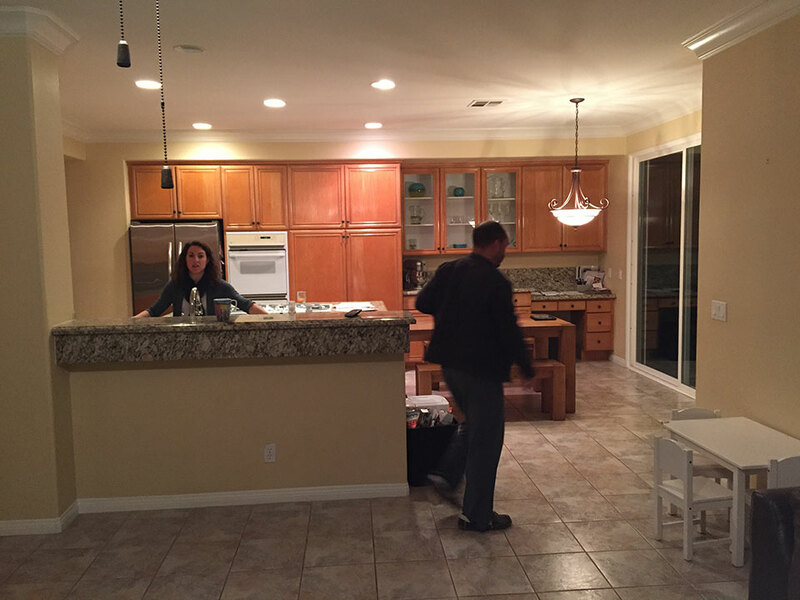 The former kitchen was rather basic and cookie cutter. 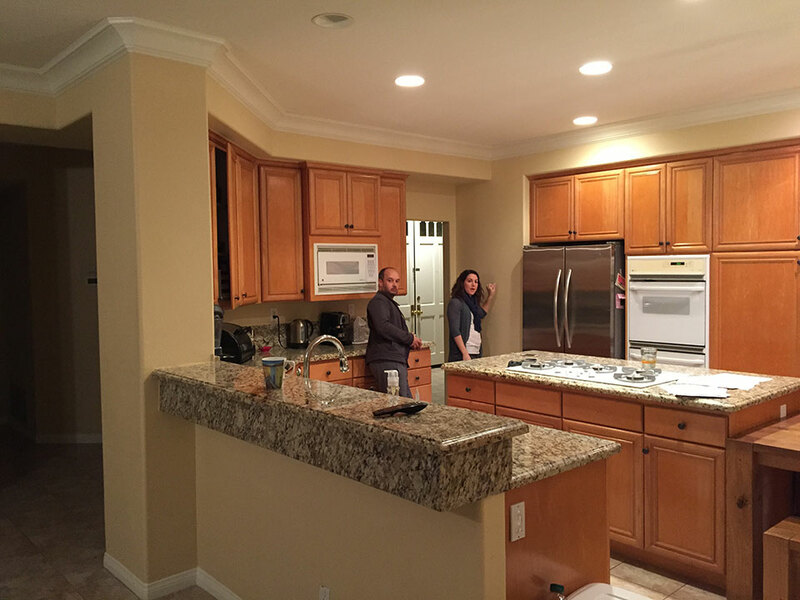 It had typical wood cabinets in a bulky build, as well as generic dark granite countertops. 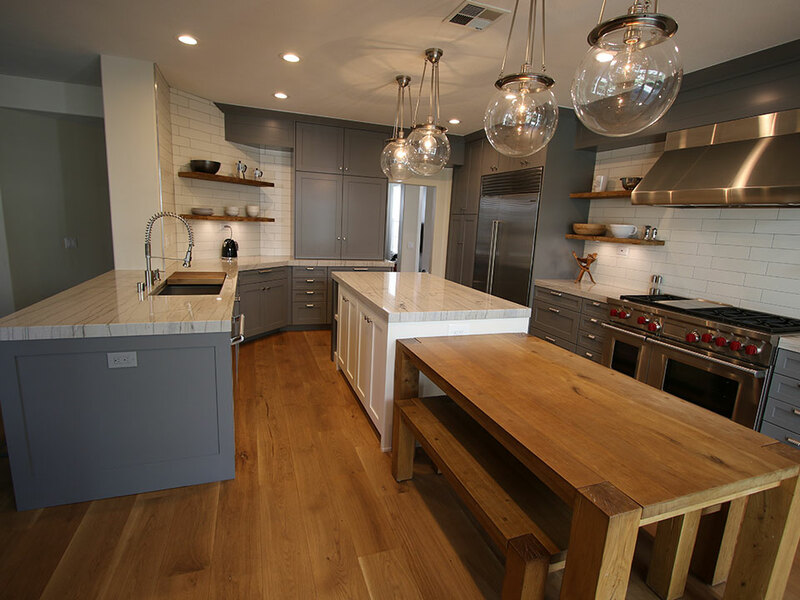 The owners were seeking a more modernized look that had a mixture of industrial and rustic design accents. 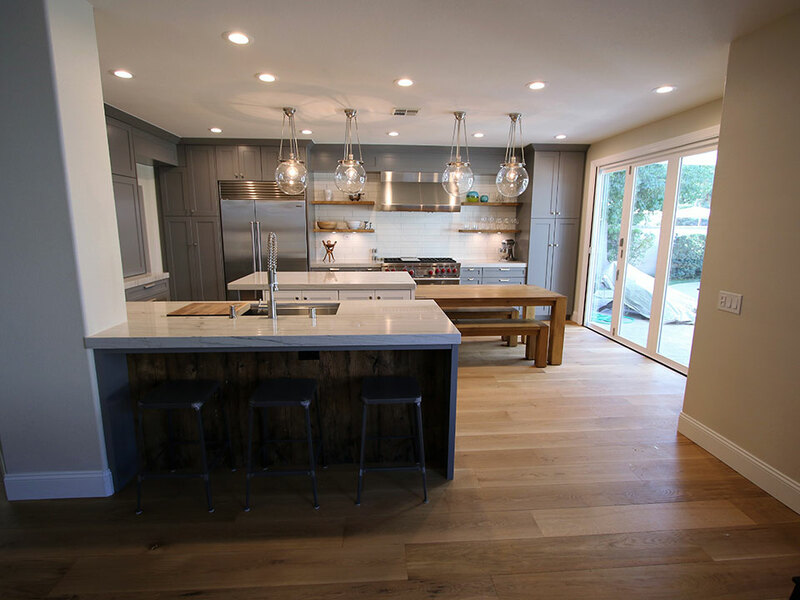 We completely demolished the old kitchen and relaid the floors with rugged oak-hued hardwood. This rich golden color provides a warm base that contrasts well with the cool tones and modern elements we added afterward. 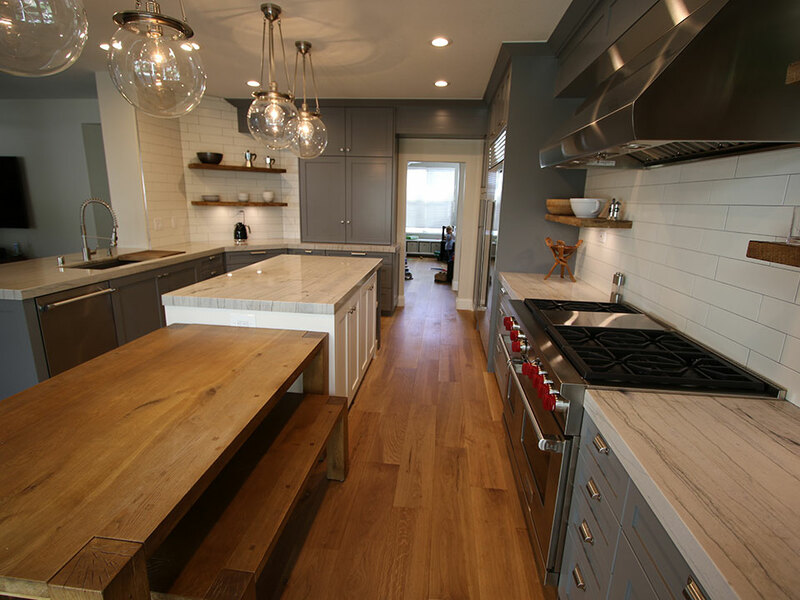 The maple custom cabinets were built in a Euro-style construction with 3” Shaker doors, according to a U-shaped layout. They feature Square crown moulding and Colonial base moulding. We painted them in a slate-toned finish called Legendary Gray. 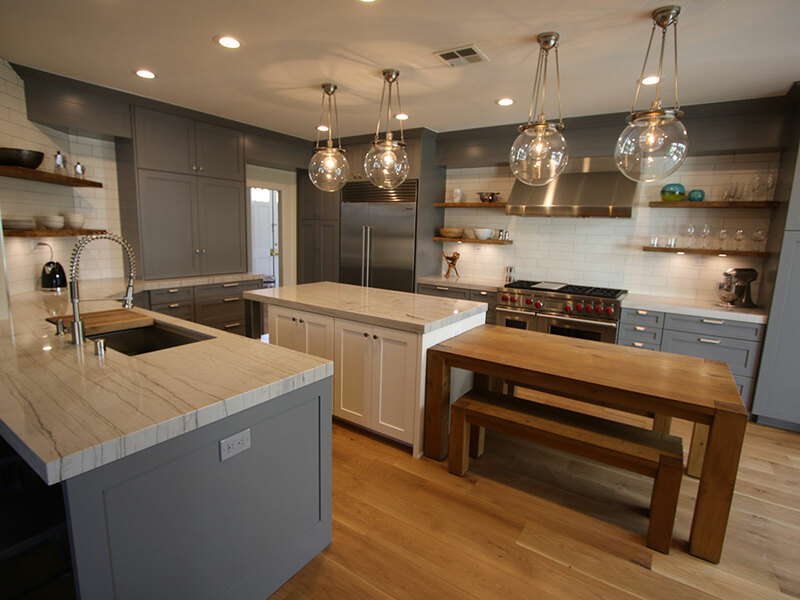 The cabinets were outfitted with spice pulls, a double trash pull and custom floating wood shelves above the stove area and the diagonal kitchen corner. At the breakfast bar section, we left a cutout space for legroom, and faced it with a nut-colored wood panel that features a convenient electrical outlet. 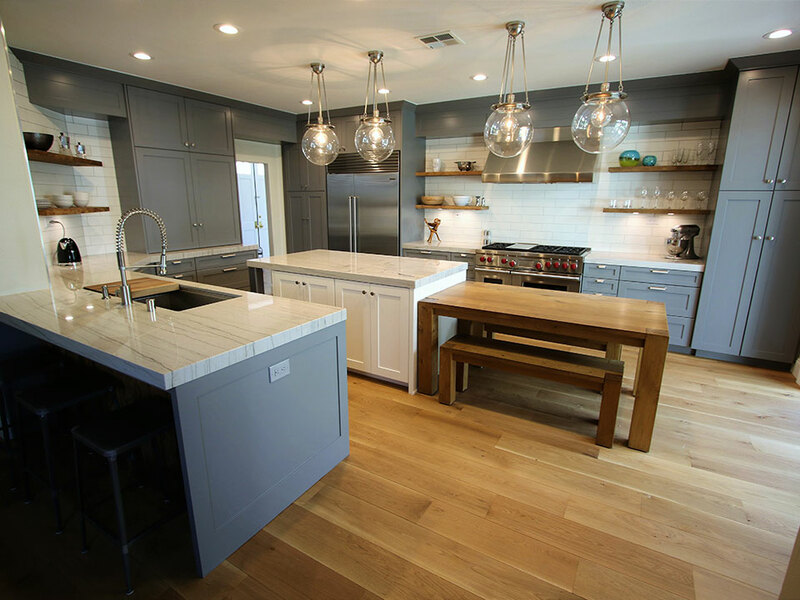 As for the center of the kitchen, we constructed a custom center island with a finish of Whisper White, sporting sturdy dark posts and shelves. It has cabinet storage on both sides, including pull-out tray shelving. A quaint wooden dining table with the same coloring as the flooring and wall shelves acts as an extension of the island, and its minimalist bench seating keeps things streamlined and unobtrusive. 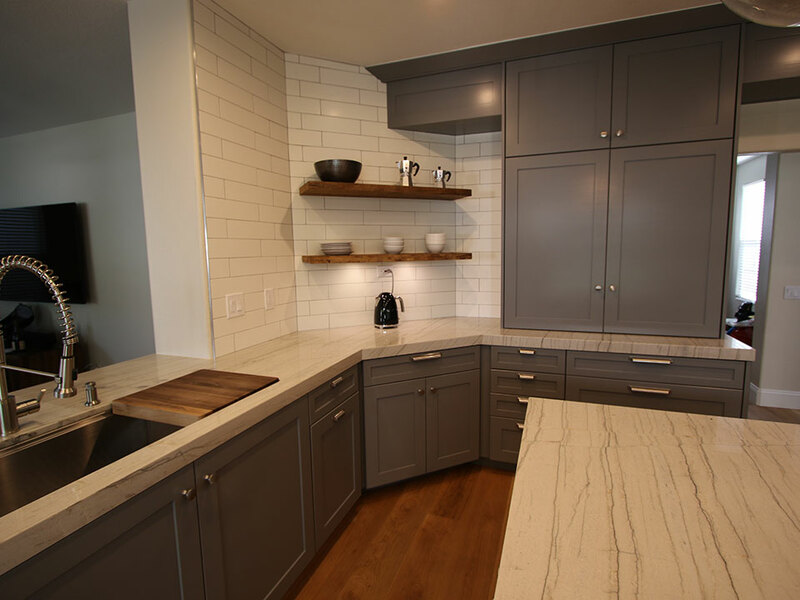 All of the countertops are made of a lovely pale gray stone with delicate dark striations. The glossiness of their smooth texture is enhanced by the industrial globe lights that hang in a row above the center island. Light also spills in from the large glass door along the outer wall, which leads to the backyard. The exposed walls were covered with Imperial Bianco Gloss 2” x 12” Tiles to keep the kitchen’s new style airy and bright. To maintain the industrial theme, all stainless steel appliances were selected. The Thermador Star-Sapphire Series Dishwasher is situated in the breakfast bar section, next to the Kohler Chef Inspired Collection Stages 45” Under-Mount Kitchen Sink. 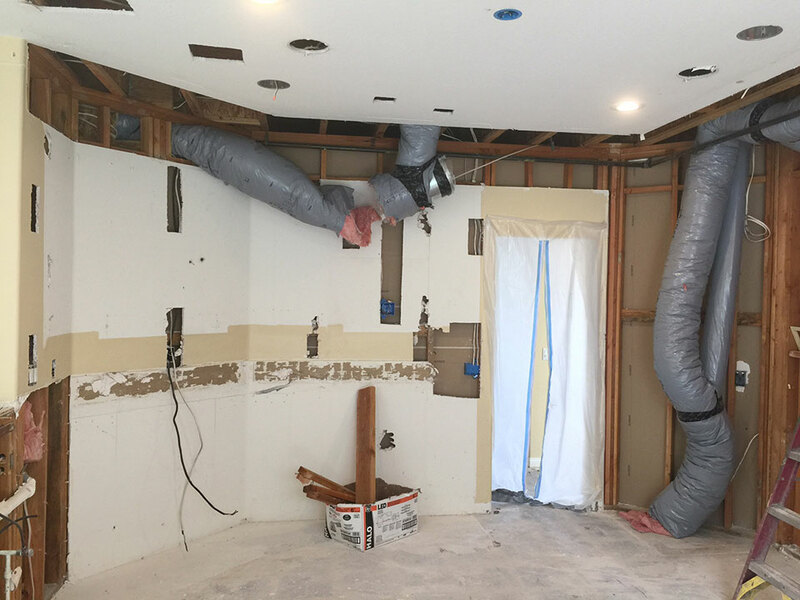 A Wolf Pro 24” Deep Wall Hood is seated above the Wolf 48” Dual Fuel Ranges, near the large Subzero 48" Built-In Side-by-Side Refrigerator with Internal Dispenser. 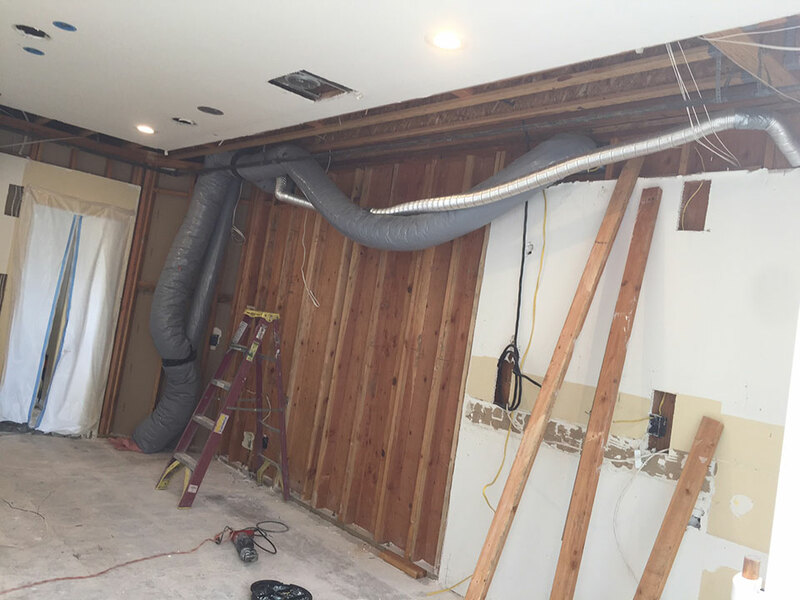 Do you have an Orange County home in need of remodeling? Contact APlus today for a free quote! 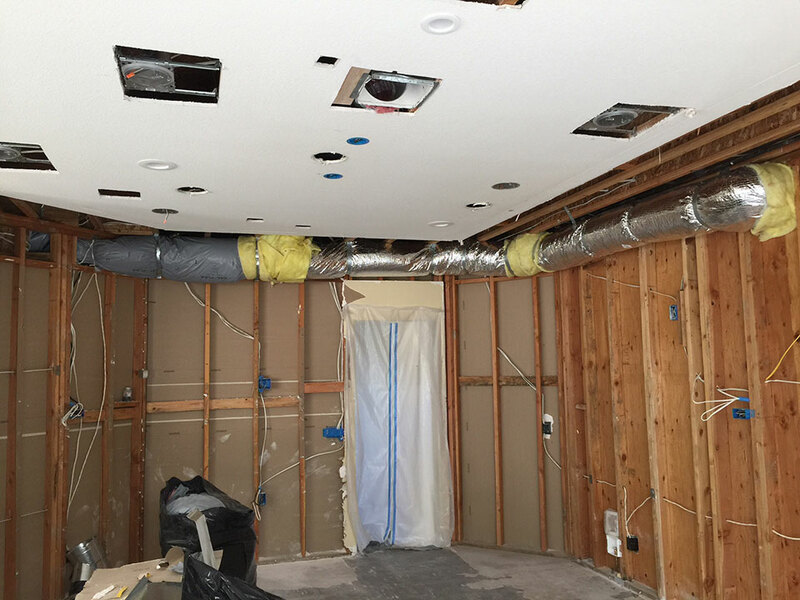 Our professional renovation contractors would be happy to help you start your project!